Note: This blog post kicks off with Section 1 of an article discussing alternative myopia research and the proven success of Natural Vision Improvement (NVI). For those of you who’ve been led to believe that myopia is irreversible and incurable, NVI is an encouraging and empowering choice which dispels the tired old dogma. The other four sections of the article will be added in subsequent posts. As discussed in the article in my previous posts (“Orthodox Myopia Research: Blind Alleys and No Cure”), eyeglasses prescribed for myopia during the nineteenth century were considered to be injurious to youth, because their eyes were still growing. Some eye doctors back then would never prescribe eyeglasses to children. Others, in some circumstances, may have prescribed weaker lenses than the full correction, under the condition that the eyeglasses were to only be used for seeing distance objects and never to be used for near work. Spanning over two centuries, myopia research has seen a few twists and turns along the way but, essentially, the massive volume work by countless specialists has come full circle. The prevailing nineteenth century theory was “[t]hat short-sight itself cannot be looked upon as hereditary, but only the tendency to short-sight.” The affliction was considered to somehow be a combination of genetics and environmental factors, especially excess near work in school. Fast forward to today, where the theory is “a melding of [genetics and environment] into a richly detailed combination of both nature and nurture.” No matter how “rich” the myopia theory is considered to be, it’s impoverished from the standpoint of finding a cause. Without a definitive cause, the orthodoxy can offer no cure. The work of an independent eye doctor emerged in the early twentieth century that challenged the bogged-down status quo. 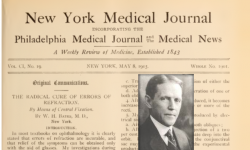 William Bates, a practicing American ophthalmologist, believed that neither heredity nor excessive near work were factors behind the onset of myopia. He wholeheartedly agreed with the nineteenth century contention that eyeglasses, simply a palliative, were an ineffective and damaging long term treatment method. His radical new theory of myopia being an acquired condition meant that it could be managed and reversed naturally without resorting to optical poison. Bates was an accomplished eye surgeon, performing operations as needed for patients with serious eye diseases and ailments. He also treated run-of-the-mill problems of blurred vision, including myopia. 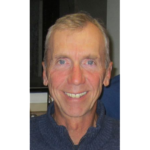 He had prescribed eyeglasses as the conventional treatment for many years until he realized they weren’t helping his patients, and were probably worsening the condition. He was determined to find a better way, and did so after years of extensive research. Since he wasn’t tied to any specific dogma or others’ agendas, he could be truly independent in his work. Most of his research papers written over many years were published in the New York Medical Journal. No phase of ophthalmology … has been the subject of so much investigation and discussion as the cause and prevention of myopia…. Voluminous statistics were collected regarding its occurrence, and are still being collected. The subject has produced libraries of literature. But very little light is to be gained from the perusal of this material, and for the most part it leaves the reader with an impression of hopeless confusion. Most of the confusion lay in the two myopia theories — excess near work or heredity. There were anomalies and observations that didn’t fit neatly into either side of the argument. Figure 1.1 William Bates (1860 – 1931) was an American ophthalmologist who, through extensive research, discovered a new theory about the cause of myopia. He developed natural methods to improve the condition, previously thought as incurable by the orthodoxy, without resorting to eyeglasses. 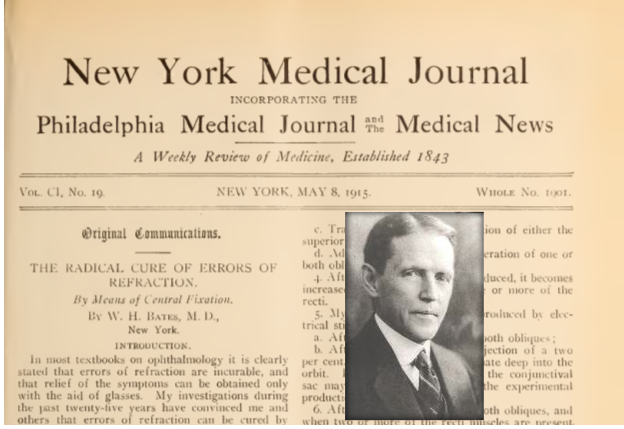 Most of his numerous research papers outlining his theory, and countless successful case histories, were published in the New York Medical Journal. W.H. Bates, The Cure of Imperfect Sight by Treatment Without Glasses, (New York: Central Fixation Publishing Co., 1920), 251.